Apple told everyone that the new Apple TV had an A4 chip, HDMI out with 720p support, WiFI, etc, but what everyone wanted to know was what the actual device hardware specs were… how much RAM does it have, how much local storage, does it run iOS? The new Apple TV is also really small, coming in slightly less than 4″x4″ and less than an inch high. You can see specifics about the dimensions and video and audio formats on Apple’s official specs page. The new Apple TV is looking better and better for $99. The RAM and flash storage capacity were discovered by iFixIt during their teardown of the device, and indicate that the device is just as powerful as an iPad and iPod touch 4G, although slightly weaker than the iPhone 4 due to a slightly different A4 chip and half the RAM (iPhone 4 has 512MB RAM). Since the new Apple TV runs iOS it means a Apple TV Jailbreak is just around the corner… 8GB of storage is enough room to store a fair amount of apps and still cache video and media through the AirPlay streaming service. 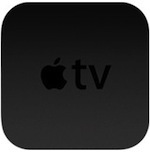 I am very excited to see where the Apple TV takes us! There is also an additional storage slot but I don’t think it is user accessible, but that would suggest that if apps and streaming catch on Apple will be able to easily upgrade the device to greater storage options like the iPod through adding another NAND chip. I already ordered one, still waiting for it to arrive though. Oh and in case nobody noticed, the Apple TV is listed under the iPod on Apples website – it’s just an iPod without a built-in screen.